I am passionate about music - classical in particular - although I am interested in most other types as well. I love playing the piano - but actually get more pleasure from teaching others. I am a mother of two teenage sons - both of whom I have taught to play piano to grade 8 standard. I am a grade 8 pianist myself and also have a BA honours degree. 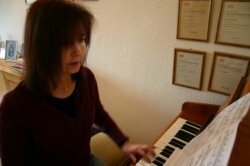 I have been teaching piano for 11 years both in my own home and at a local primary school. I have an excellent ABRSM exam success rate. In addition to teaching piano, I also teach music theory (mainly so students can pass their ABRSM grade 5 exam). I teach anyone from aged 7 upwards. (My eldest student is in her 80s and I have no upper age limit). I specialise in beginners - although I have taught several students to grade 8 standard. Most of my students choose to sit ABRSM examinations but - although I encourage this - I am also happy to teach those who just want to play for pleasure. JanFrom Claire (5/5): This year I decided to learn the piano having no previous experience of playing an instrument or being able to read music. I contacted Jan and she immediately was able to fit me in on a day and time which suited us both and provided me with lots of info regarding purchasing a keyboard/piano for practice. Jan has been an amazing tutor, she is very patient and explains things clearly and her hourly rate I feel is very competitive within the marketplace for teaching. I would highly recommend Jan if you are a beginner or even an experienced player. She’s a great teacher!